Boil tomatoes to better peel them, then chop them. 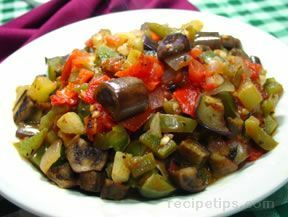 Wash peppers and remove the seeds to chop into large chunks. Cut all the veggies into cubes. Put them in a colander with a weighted plate on top to get maximum juice. In a large sauce pan heat oil. 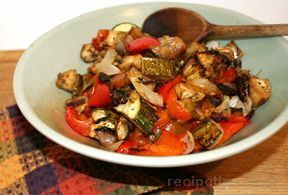 Add onions first, then add the eggplant, zucchini, pepper, and tomatoes. Cook for 35 minutes. After cooking for 15 minutes, add salt, pepper and garlic. Serve hot or cold. Can also be frozen and reheated.